Town boss Nathan Jones admitted he erred on the side of caution by putting in Pelly-Ruddock Mpanzu ahead of Akin Famewo for the FA Cup third round clash at Newcastle United on Saturday. Prior to the game, Jones had confirmed he would have had no issues in using youngster Famewo in such a high profile tie at top flight opposition, although on the day, opted for Mpanzu as the holding midfielder, with Glen Rea dropping back to partner Johnny Mullins in the heart of defence. When he’s played in that role, he’s been brave, got on it, we’ve had some wonderful performances from Pelly in that defensive midfield role. Explaining his selection, Jones said: “It was a tough decision. “It was either do we put Akin in who’s slightly more up to speed than Pelly, but has far less experience against a wonderful strike partnership? “Or do you go with the slightly safer option? And we probably went with the slightly safer option. “But also with Pelly, when he’s played in that role, he’s been brave, got on it, we’ve had some wonderful performances from Pelly in that defensive midfield role. “So it was a calculated one and who’s to say if we did anything different, it would have been different? “We made a big error for the first goal and then a big error for the third and if one of those maybe hadn’t gone in, then it might have been a different game. “But it’s hindsight. We’ve learned from the game, debriefed, there’s a touch of disappointment and pride, that’s the only thing. Mpanzu only played for 45 minutes at St James’ Park, replaced by Harry Cornick at the break, with the visitors trailing 3-0. 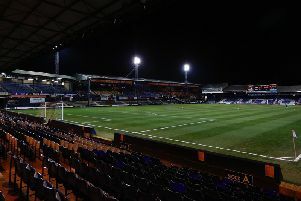 The attacking switch ensured Luton were on the front foot for the second period, as they pulled a goal back through Danny Hylton, had another disallowed and gave their hosts a real scare. After the game, Jones spoke about his substitution, adding: “We had a little bit more balance about us (when Cornick came on). “It was a big ask for Pelly to come in and do that with (Alan) Sheehan obviously out. “We’re a bit light in the defensive centre back area, we had to move Glen from that area, we didn’t want to do it but we did. “It was just maybe a game too far after coming back in as he’s not quite found his feet yet, in terms of match fitness. “But we’ve given a wonderful account of ourselves second half and showed what a good side we are, and that we can punish and hurt a Premier League side when we’re right at it, and that’s wonderful. “It’s not like a League Two v Premier League game where we’re at home and the wind’s blowing and we’re going long, smashing into them and causing them physical problems.